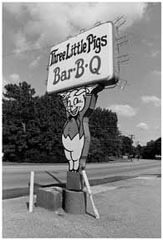 The plywood pig hanging perpendicular to McLemore names the place: Candy Man Lounge. The few parking spaces in front are as empty as the lot next door. Black iron bars block all the entrances. Midday, midweek, and nothing is happening here. 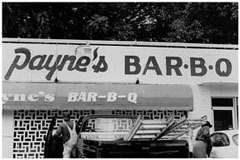 Before the Candy Man moved in and crapped out, the store housed Hawkin’s Grill. Started in 1938, Hawkin’s turned out shoulder after slow-cooked shoulder for the better part of six decades. 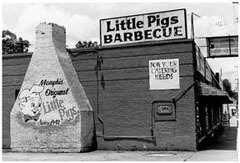 It was there that J. C. Hardaway, one of Memphis’ world-renowned pit masters, got his start at the age of thirteen delivering orders on his bicycle. Before long, J.C. traded in his pedals for the pits. He cooked hamburgers and chopped the meat as it came off the coals, all the while soaking up secrets and learning the tricks of a trade that would feed him and his community for years to come. 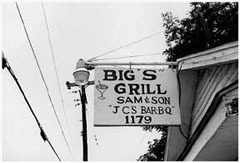 In 1993, J.C. took his tongs and walked around the corner and down Dunnavant to the Big “S” Grill. 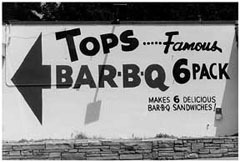 Now that J.C. sends his smoke up their stacks, they’ve added his name to the sign and his barbecue to the board, which for years sold only soul food. Listening to J.C., one wonders if there is a difference. In the restaurant, Hawkins Grill. Eighteen, but I started at 13, 14, riding a bicycle delivering orders. At that time they didn’t allow children [to work] in restaurants until they were of age. And, at the age of 18. So after I reached 18, I went inside and started working around, and started looking around and started cooking. Hawkins Grill, they were my godpa rents. Did you try to spend time in the kitchen when you were younger? Did you get shooed away? I think it might be that it was in my blood. Just in me that I would learn it. I was around it. I just picked it up. Nothing but regular food. Soul food. Home cooked food. No barbecue just home cooked food. Beginnings in the Hawkins Kitchen Frying hamburgers and selling sandwiches, chopping up barbecue but I wasn’t cooking it. Who did you learn to cook from at Hawkins? No teacher. Just picked it up looking. Just looking. We didn’t take time to teach you. You just picked it up. They said “here’s the job”? Here’s the job and if you couldn’t do it you had to go I guess. Who was in charge of barbecue at Hawkins? Since I was 18. 59 years. How long was Hawkins Grill open? From 1938 and I left in ’93. Big S since ’93. It’ll be nine years in October. Yes. I enjoy cooking for the public. It’s just a part of me. At the age I am now, I don’t need nothing else but that basis. A favorite part of cooking for the public? I can do pastry. Most anything. 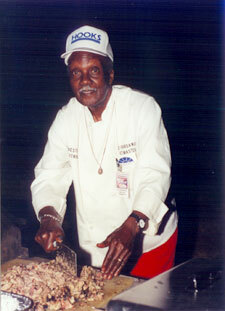 But I do barbecue especially if I have a party I’ll fix some barbecue beans, spaghetti, potato salad. That line of food, party food. Even cold plates, you know, if necessary. Did you do catering at Hawkins? Where’d you learn to do catering? I just picked it up. I put it together myself. It just have been my style of life, cooking. Most people just don’t learn pastry. No, that’s what my wife says. I’ve got so many cakes and pies on order now that they’ll never get them. We’ll I told her I’m not thinking about them. When’ll he get to it? We say whenever he feels like it, he’ll fix it but he ain’t in no hurry. It’s not my job. I let them know I stopped doing all that. I took cake decorating at Sears back some years ago. Much, much, a long time ago. I don’t even know where my utensils I use. I couldn’t find them even if I wanted to. Commercial cooking give experiences or connect you to parts of the world that you never thought about before you started cooking? I have them all over the country. Overseas and everywhere. Wanting to hear about me. They want to know how I do this and that. They ask me am I going to be in and some of their friends send them by. People call from all over the world? When can I get with you? 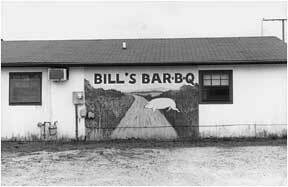 I want to taste that world famous barbecue. I never knew that I’d be world famous. They say, you put everything into yours. You don’t throw it up and sell it. You take pride with you food and your orders and get them out right. Whether it’s one sandwich or fifteen sandwiches, they all taste- I fix them all the same. Has Your Cooking and Food Afforded You Chances to Travel? Yes, I just back from New Orleans . October the 20th, I had to cook for a charity ball for the children. 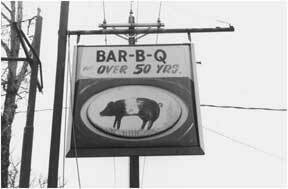 It was at a little college in New Orleans and the mission was J.C. Hardaway barbecue and ten dollars. Pay ten dollars and you get to see the movie- the movie Smokestack Lightening, which I’m in the movie- Cozy Corner is in the movie. 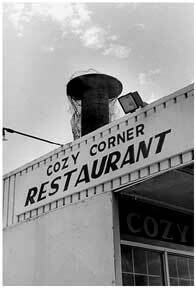 The three Memphis people in the movie is Cozy Corner, Big S, that’s me, and Charles Vergo. 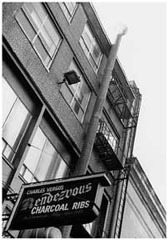 Cozy Corner and Charles Vergo is Rendezvous and Big S and J.C. and we’re the only three in the movie. So the movie. The movie is on sale now. Did you ever think that you’d be in a movie? No. I was flattered when they come from California to make the movie and the book. I’m getting a lot from the book. Because if you buy the book or see the movie, you can get everything out of it. 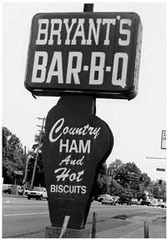 Your food has gone way beyond Memphis. I’ve had from Russia , everywhere. I think I’ve had some. There’s no telling. I don’t know. I’m just amazed. Some come up in here where I couldn’t understand what they were saying. One man brought two people from overseas in here I couldn’t understand- I forget what they were- but- I have a lot of them. Every day I get somebody from out of town. How do they contact you? Call? Come by? Pick it up on the Internet and they’ve heard about it. They have the number. Using the Internet and the computer. Plus whoever they know in Memphis , they will bring them. I have quite a few customers bring people from out of town all the time. Directions and Names from the 2000 SFS. Learned anything about people or customers? Oh, yes. I have learned a lot about them. I know I have, sure. You meet all kinds every day. Every time you see. You have to have to have it this way or that way. If they have it your way it tastes better but – most important thing about the food that goes out to customers. Customer experiences. I let them tell me what they like about it. That the smoke and the sauce and the slaw without that they wouldn’t have a barbecue sandwich. They’ve got it but no taste. Some sauce put on top of it. Sauce it too much and it still makes it worse. What are you putting into your food that elicits customer statements such as “You put everything into your food.” What gets customers to say this? Time. I just don’t throw it on the bun. I cook the sauce in. Time- how long do you spend on a shoulder? I tell everybody I don’t have a certain time. I just smoke it until I feel like it’s time. You know. Somewhere 6-8, 8 hours. The smoke is really what cooks the meat anyway. Hot smoke. Hickory , white, or red oak. Hickory only comes one but oak comes white and red. So, either one. If you use white oak the meat is white. It never turns the pretty color. If you use hickory on red oak the meat- all the way through- has a very pretty color. The white oak will not give it [color] too it [meat]. Just give it white meat. I never use charcoal. Because you don’t get as much flavor out of it. It’s already been cooked all to pieces to make charcoal. It’s not enough left in it to smoke and nothing to bring it out. Dried cordwood. Hot fire. Flame. J.C. uses the flame. Get it hot with the flame. Brown it on both sides. Brown it. Keep your fire hot and the smoke’ll cook it and then that wood will keep warm. It’ll blaze up every once and a while. If you leave it open it’ll burn up. But if you slow it down, you get a better piece of meat. I have no idea how they cook their meat with that charcoal. Slow process. In New Orleans they tell me the smoke is on one side and the meat is on the other [in the pit] and the smoke has to travel over there. There’s not enough smoke in it. In New Orleans , they’re putting the meat on one side of the pit and the fire on the other side. And the smoke comes over to the meat. That’s where they get their smoke in it. But that’s not enough smoke. 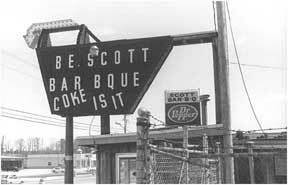 It’s not very good barbecue [fast food barbecue]. 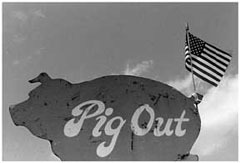 Why do folks pursue barbecue? Well they see it coming off the pits. They know how its cooked and they it’s more expensive that way than making a hamburger patty and throwing on there already come in pre-cooked. Seeing you cooking means something to customers? It means that it’s right out of the pit. What do you hope customers say? Has Cooking at Hawkins and the Big S allowed you to do something that you never imagined? Yes, cause if anybody told me that I would still be in barbecue I would say no I wouldn’t. I sure wouldn’t. I didn’t know- after it got to be a big thing after they come by to interview me for the book Smokestack Lightening then I thought there must be something good about it. That’s right. I wouldn’t. Never dreamed that I’d be in a movie about cooking barbecue. 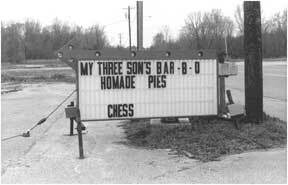 I just hate that they didn’t get it all at the Hawkins Grill where I was raised, you know. 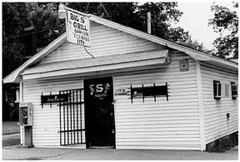 I was there at the grill and I would loved for them to have had the praise but it didn’t work out. 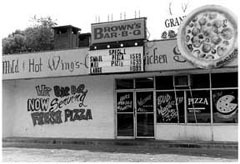 Hawkins Grill- did it close in 1993? I left and they kept it open somebody else come and leased it. Still called the Hawkins Grill? No. Another man got it [after several leases] and changed it [name] the Candyman Lounge. 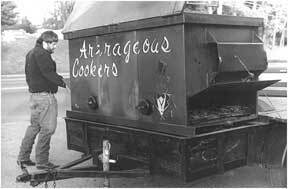 He still advertises Hawkins Grill barbecue though. Commercial sent some men out after they heard about the barbecue I was doing and had them to taste it. 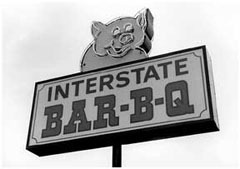 Well it sure don’t taste like no J.C. Hardaway barbecue. If it tastes like this I sure don’t see how he got all the praise. The guy was posing as me. But it didn’t taste like nothing. That’s what I said. It didn’t taste like what it should have tasted like. They didn’t know my slaw and my barbecue sauce. None of that. They left and have made a nightclub out of it. Hawkins Grill 2. They didn’t want to turn Hawkins Grill lose. They didn’t make no hickory and he had to get out. And this last man was Candy Man. He wouldn’t do right. Wouldn’t pay his rent. So they had to let him go. Now it’s up- I think they tried to buy it several times. My godmother wouldn’t sell it. My godmother’s 97, see, now and at that time she was a few years younger. Now she wants to sell it. But his young man he don’t want to buy it, he wants to lease it to have a sports bar. So that’s what they have down there now. If it ever opens. He’s been over a year trying to get it open. I’ve never seen nothing take that long to open. How many days a week do you still cook? I’m here seven. I know that I can meet you this morning because I don’t have any specific thing going. Most of my business that mean anything, are call ins. Like last night, if anybody wanted me to meet them today for lunch. I don’t have a straight lunch period cause down in this area it’s off beat it’s not a through street where cars travel like McLemore. Now Hawkins was on McLemore, a through street. You could pick up all kinds of money. It’s quieter down here. I have walk-ins [customers]. They’ll smell me cooking and they’ll come and after they’ll call and get so many sandwiches. Do you do walk-ins at night? I would, but I got sick in ’99 and I stayed off three months, March of 2000. I had a sugar attack. I’m diabetic and I didn’t know it. I new I was messed up some kind of way about it. That bad. But I was putting up too much time- 24 hours. I didn’t think I could break down. Now I come here at ten and today I will stay here until 7 or something like that. ‘Til the people start dying. How much do you cook each week? Approximately 125 lbs. a week and no ribs. That’s another thing. 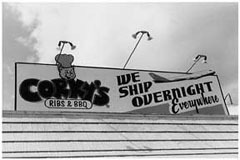 Ribs, they want me to have ribs, but they’re not an everyday seller and they’ll dry out. Shoulder will not dry out and sell every day. He cooked on the corner and I was the delivery boy. Leonard’s was opposite Hawkins. They called it black barbecue. 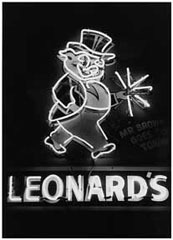 Leonard’s was called, at that time, the white folks’ barbecue. 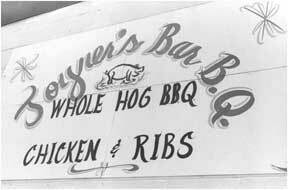 Where they had the black folks come over to Hawkins. At that time it was segregated. My mother wanted bought sandwiches from Leonard’s before I was old enough to drive. 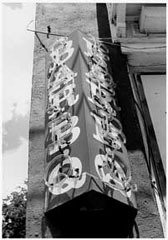 Before Hawkins opened. People in the neighborhood, we had to go to the back steps or the side door. This is a little hall and the window was there. You’d pick up your stuff and in there was dining room. I do that now. Charge .50 or whatever you want a pound. 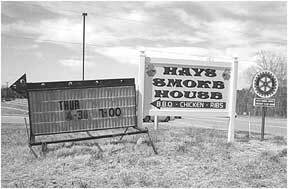 When I was at Hawkins, it was .35 a pound. Now I’ll get .50. I think that I started getting .50 before I came up here. 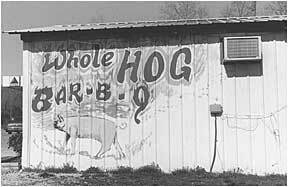 But if you want me to cook you some ribs or a shoulder- a slab or two of ribs- I won’t even fire my pit up for that. Now if I’m already cooking, but just to fire it up, somebody’s got to have enough meat. 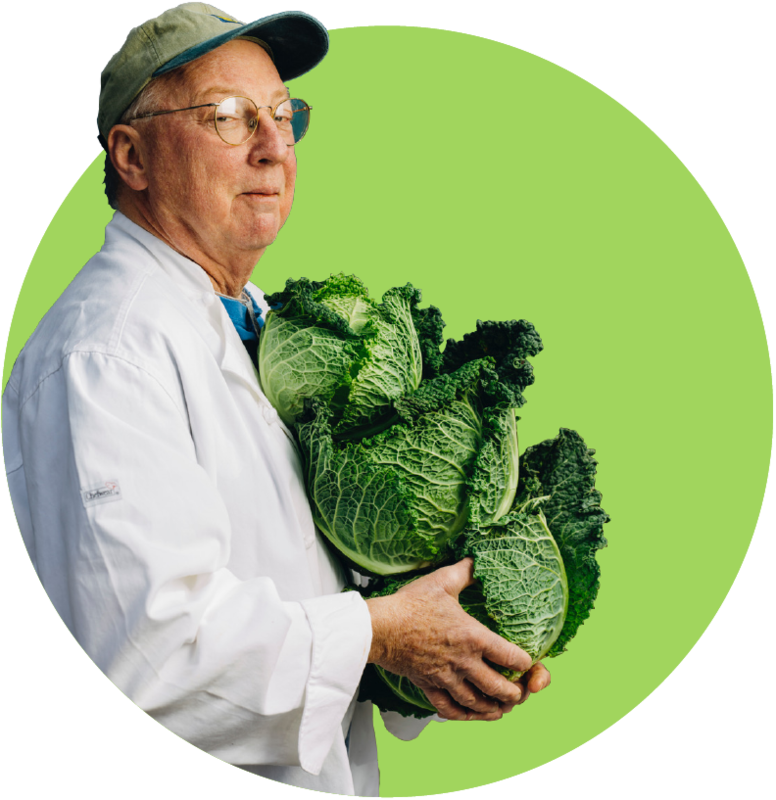 I sell slaw. I sell barbecue sauce. Anything they want to buy. Sauce. Slaw. .50 a pound. A ten-pound piece meat. That’s just $5. That’s not worth it. But say if you’re cooking for yourself and throw it in there, that’s money. You’ve made something. If I’ve got enough people- like five people- I’d cook for that. That’d be all right $25. That’s not bad while you’re working. Don’t take nothing to stick it in. But you don’t’ fire your pit for not 2 or 3 pounds of meat. Oh, yes. Sauce, slaw, everybody wants the secret. Do you have an understudy? You’re going to ask me that part aren’t you? I refuse to train. You can’t get anything now but drugs and even they come in wanting to do, they walk off. I wouldn’t want a girl. I know I’d want a man cause he would be more stable. He would be more holding a job up. A woman would get married and her husband tell her to come home. A man can’t do that. Like me. I’m determined not to leave. I’m holding it down. You don’t find many like- you broke the mold. Oh, yes. They’re supposed to have it, but they say you’re lying. That’s not what you put in it. I tell everybody to do everything and they tell people that they cannot get it to taste like yours. Just give some of yours. Make me a ball, because I don’t want that mess that you told me to fix. My godmother always told me when I was growing up they would come into the café. Figure how long I’ve bee having this- experience- the people liking the barbecue. And, way before she thought about retiring and I supervised a couple of paper companies after I come out school I was working management at two paper companies. 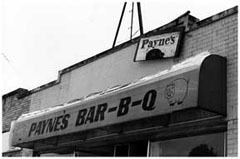 I never did leave two or three days at the grill [Hawkins]. I worked three or four nights, especially weekends. But I got married and just worked part time. But I never missed a week of being in that place [Hawkins Grill]. So, when I would go on vacation, when I started working a little bit more. People would come there and say- look in- and they didn’t see me and they’d say can we help you? And my godmother would say they’d say no “we’re looking for J.C.” We’ll he’s on vacation but we be back when he come back. She’s say we can fix it. No, uh, uh. You can’t fix it. She’d come over. Now look, come here. This is the slaw. This is the barbecue sauce and this is everything that he uses. Now why would his taste different from mine? So she told me one day. Baby, I can’t understand that. You use the same thing we use. There’s something about that. My wife says it’s just a gift to you- something about your hands. It’s the same thing. Something with your hands that’s not with everybody else’s hands. I don’t hide them. I let them have them but they tell me “you’re lying.” That ain’t the way you fix it. I say that’s just the way I fix it. They don’t want to believe it. God Give everybody so much if barbecue is yours that’s it. I like good times. I like to go out. But when I’m on the job, I’m on the job. When I leave I go dancing. When I’m messing around, I’m messing around. But, then, when I’m working, I’m working. People say come out here and talk to us. I say, I don’t have time. 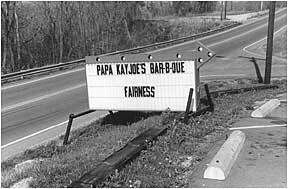 I’ve got to have my slaw and barbecue sauce ready for the weekend. I don’t have time. I don’t drop my work and sit down and get behind then go look crazy. I never run out of nothing. I make a gallon every time. A hot gallon of barbecue sauce. I make three times as much mild as I do hot. My hot is hot. A drop is hot. Put me a little bit. J.C. you put more than a drop on there I can tell. A drop will do of yours they say. When I’m not there, they won’t accept it. They couldn’t make no money if I leave. When I go on vacation they lock the kitchen up. They close down. We’re not going to try to fix that stuff J.C. We’re not going to mess up nothing. We make it taste like his now. No. 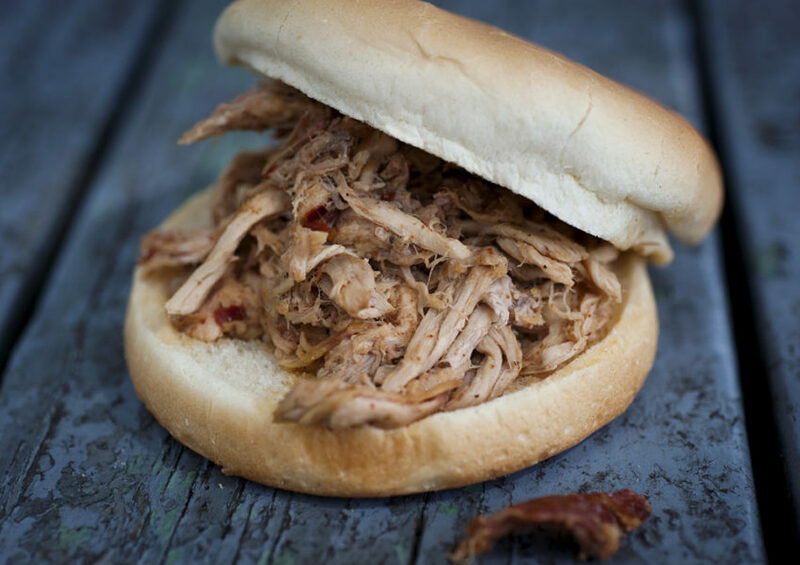 Some days I could have a hundred- a hundred barbecue sandwiches. And the least I fix is 25. I have man start coming. He comes every day. Now I said “please, don’t make yourself sick.” He wouldn’t let me hurt his feelings. He came right back the next day. He used to be one of my customers down on Hawkins. He said I didn’t know where you moved to. He was here yesterday. I said, Lord, you’re going to hurt yourself. No I ain’t. No I ain’t. I’ve been out about 8 years now I’m getting back in it. I can’t hurt myself right now. I’ve got a long time to go. I’ve got to get it back in my system.